Comets Giving Day has ended! Urban STEM Camp has raised $ 1,999 from 84 gifts! Science, technology, engineering and mathematics (STEM) are some of the fastest growing professional careers. 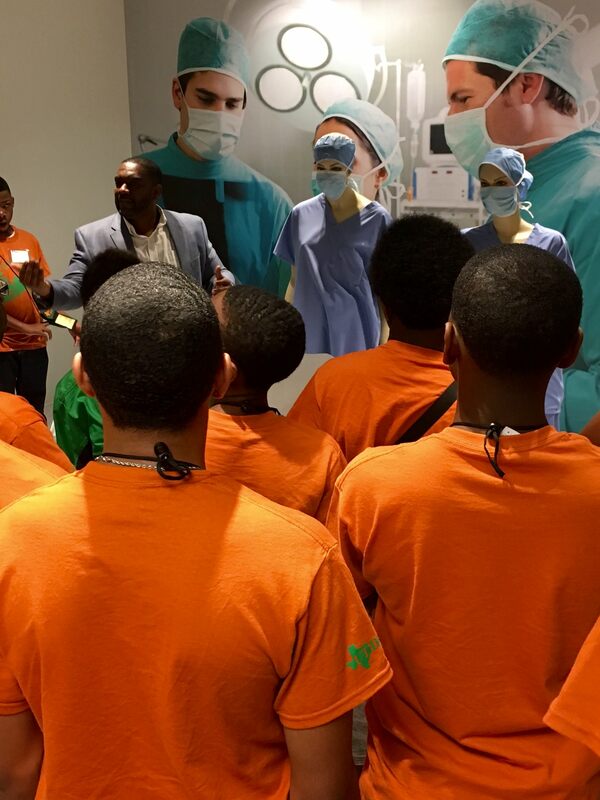 The annual Urban STEM Camp is for 30 middle school young men interested in learning more about STEM fields. The camp is held in partnership with Project Still I Rise, Inc., a local nonprofit organization focused on empowering youth through academic enrichment, mentoring, and leadership development. From robots to rockets, the campers learn about science and engineering careers through hands-on activities, visits to local corporations, and faculty lectures. The camp has been sponsored by the Department of Community Engagement since 2010 and has served 225 students. The students experience campus life by staying in the residence hall during the three-day and two-night camp. Make your gift and check out our Facebook Album for photos from the 2017 camp. Our office provides support for 30 students to attend the camp at no charge. Your generous support will help us expand the number of students we serve! The cost per student is $350, which includes housing, meals, T-shirts, transportation for the corporate tour, and supplies. The Department of Community Engagement provides programs and services to support historically underrepresented and low socioeconomic students through college preparation programs, school and community partnerships, and the Diversity Scholars Program to help increase in student diversity at UT Dallas. See what people are sharing about Comets Giving Day! We love our alumni and so do Chuck MS’80 and Nancy BS’80 Davidson! Thank you for your support. Calling all UT Dallas students! Join us from 10 a.m. to 4 p.m. on Comets Giving Day to double your impact. The first 200 students to designate a $2 gift to the area of their choice will receive a dollar-for-dollar match. Thanks again to Nancy Gundy Davidson BS’80 and Charles “Chuck” Davidson MS’80 for providing our Alumni Power Hours Challenge. From 2 to 3 p.m., Dr. and Mrs. Benson will graciously match every UT Dallas faculty and staff gift under $50, dollar for dollar up to $1,969. Thanks to Maurine Dickey, our Comets Giving Day faculty and staff power hour was a HUGE success! Stephanie Taylor was up at the crack of dawn. Congrats on being the first to give! The Department of Science and Mathematics Education will be receiving an extra $50 in bonus funds. It paid for Maria Valente to be the last gift of the night. Congrats on winning The Ackerman Center for Holocaust Studies an additional $100 in bonus funds! Thanks Courtney Keeler for sharing what philanthropy means to you! Student Ambassadors will receive an extra $100 in bonus funds. Courtney Keeler takes this one. Congrats on earning the Student Ambassadors another $50. 1982 was a great year for Melissa Wyder, our winner of the Cap and Gown Challenge and an additional $50 for the Department of Science and Mathematics Education. Congrats to Wendi Kavanaugh for your awesome selfless selfie. @IndigoCrush won this challenge, all while writing her dissertation! Congrats! WOW! Delta Zeta helped raise money for Callier Center for Communication Disorders and they will also receive $50 in bonus funds for winning this challenge! We had a lot of night owls up, but one stood out. Congrats to @Lissette3640 on winning $50 for the Academic Bridge Program. Way to go! Thanks to all of those who posted their adorable UTD kiddo photos, Holly Miori's children won this prize money for the Ackerman Center for Holocause Studies, in honor of Zsuzsi. Congrats to TeddyRooseveltP for winning this extra $50 for the Honors College. Thanks to all of our stellar supporters and those that used our Snapchat filters, the winner of this challenge is the Department of Materials Science and Engineering. Congrats on winning an additional $50 in bonus funds! Congrats to Larry Redlinger for being our UTD 8-8-3 winner of an extra $50 to the Comets Golf program! He had it timed perfectly, congrats Scott Porter on winning an additional $100 for the Comets Volleyball program! 1969 was the year UT Dallas was founded and Joseph Kohan was the 1,969 gift of the day. The Department of Science and Mathematics Education will be receiving an additional $50 in bonus funds! Thanks to everyone who participated! The winner of this year's door decorating contest is....Community Engagement! Thanks to our Nothing Bundt Cakes fundraiser, they will be receiving an additional $150 and our second place door is Center for Children and Families. CCF will be receiving an extra $50!!! If you're on campus Tuesday, April 3, stop by the Plinth area under the trellis to grab a doughnut on your way to class or the office. Doughnuts are being offered on a first come, first served basis starting at 10 a.m.
Join us under the trellis by the Plinth for some Comets Giving Day fun! Northside pizza will be served at noon on a first come, first served basis. Stop by the Plinth area under the trellis from 3 to 4 p.m. on April 3 and grab yourself a handful of Tootsie Rolls to celebrate the impact our Comet community has made for UT Dallas during the last nine hours of this year's Giving Day. Post, share and keep the momentum going! The winner of the Care to Share challenge is Comet Athletics - Baseball! Congrats on winning an additional $100! We are OUT of cupcakes. You guys are awesome! We had so many posts going on throughout the day. $5,000 was easy! Whoa! That's a lot of money raised. Congrats, (group)! We've got our schools, centers and student affairs groups taken care of, but what would Comets Giving Day be without a leaderboard for our other amazing participants?! Support your favorite UTD area or group and help them receive an extra $250 in bonus funds! Congrats (group) for bringing in (gifts) on Comets Giving Day! Who loves their UTD community? You put the "U" in UTD! Check out this leaderboard to see which stellar group of supporters is rising to the top! Who will it be? Alumni, faculty, staff, students, family or friends? What is your affiliation with UT Dallas? Or you can contact us at giving@utdallas.edu.